Create wonderful textured fabrics with this complete guide to crochet. Essential tools and techniques are clearly explained with step-by-step illustrations, from working stitches and measuring gauge to adding embellishments and finishing off. Discover new twists on the basics and learn how to create complex-looking textured stitches, openwork and lace, multicoloured patterns, shaped motifs, afghan squares and woven and hairpin crochet. Each technique includes stitch patterns to try out, and an adaptable project section allows you to practice your new skills making original and colourful garments and accessories using your own choice of yarns and stitches. 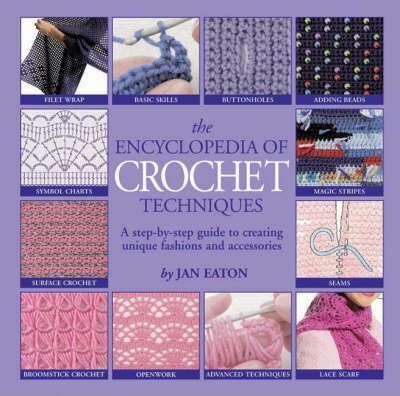 Learning and developing a new skill is never easy, but if you're determined to master crochet there can be no better helping hand than The Encyclopedia of Crochet Techniques. Bursting at the seams with patterns and techniques, this book is a great visual learning aid, designed to both inspire and encourage. The first section deals with basic techniques and typical early problems. Then there's an extensive techniques section, which increases in difficulty as your skills develop. Seven full-scale projects are included. Finally there's a Gallery section, drawn from a variety of sources across the world. It features a range of crochet garments to challenge you. Crochet, like knitting, is enjoying a revival at the moment and once again it is cool to be seen with needles or a hook and a ball of yarn. But crochet is a large subject, and if you think filet has something to do with fish or a broomstick is just for sweeping then this book will tell you much that you need to know.